HHA Hero of the Year, Anne Pannone (center), gathers from left to right with new National Hero Committee Chair Jackie Kirchhoff, Client Services Manager Elizabeth Sweeney, Retired Director and National Hero Committee Chair Ann Baiada, and BAYADA Founder and President Mark Baiada. This June, Anne Pannone was recognized as BAYADA’s Home Health Aide of the Year.in 2017. Chosen among thousands of nominees, Pannone was presented the award at the company’s annual meeting at the Philadelphia Convention Center. 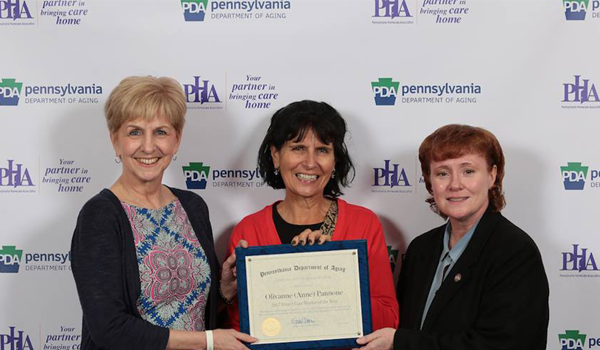 BAYADA Home Health Aide Olivanne “Anne” Pannone, from Philadelphia, has been named the 2017 Pennsylvania Direct Care Worker of the year by the Pennsylvania Homecare Association (PHA). Pannone was recognized last week among nearly 200 of her peers at the first Direct Care Worker Forum in Harrisburg, organized by PHA and the Department of Aging. Pannone has been an aide with BAYADA for more than seven years. 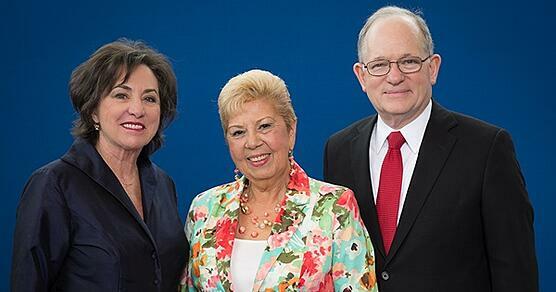 BAYADA Home Health Aide Hero of the Year Luz Sanchez (center) is pictured with BAYADA Director Ann Baiada and BAYADA President and CEO Mark Baiada during the company's annual awards meeting held in Washington, D.C.
Luz Sanchez was recognized as the national Certified Home Health Aide Hero of the Year by BAYADA Home Health Care, a leading provider of in-home care. Chosen from among thousands of nominees, Sanchez, who works for the BAYADA Atlantic County, NJ office, received the prestigious award for exemplifying the highest standards of care before more than 2,300 employees at the company’s annual awards meeting in Washington, D.C. on April 30. 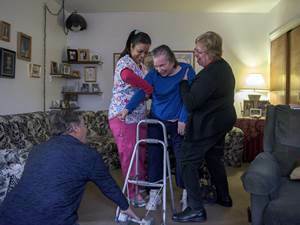 Kim Mulford, staff writer for South Jersey’s Courier-Post, reports on the dire need for increased Medicaid funding of home care services affecting recipients of all income levels and their home health aides. “The problem is, New Jersey hasn't allocated enough money to support its Medicaid program," said BAYADA Home Health Care Chief Government Affairs Officer David Totaro. Register with BAYADA Hearts for Home Care to speak up for better reimbursement rates at https://www.bayada.com/heartsforhomecare/landing/. 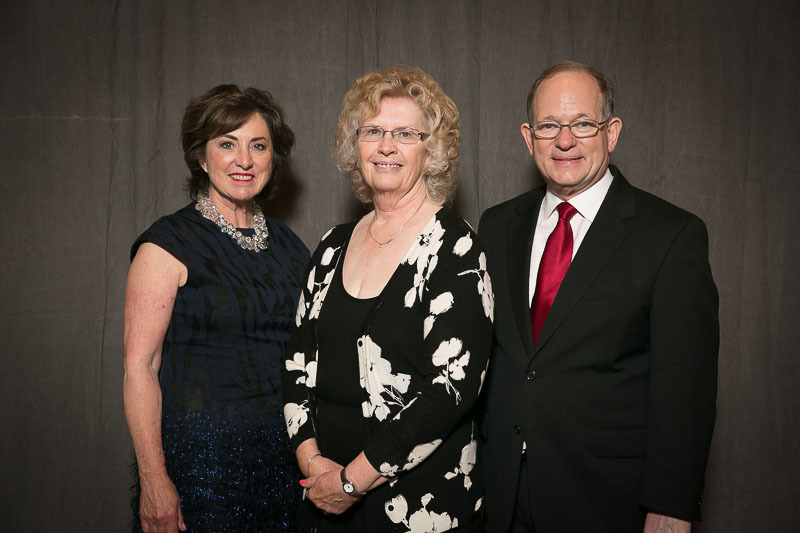 Camp Hill, PA resident and Home Health Aide (HHA) Judy Morrison (pictured, with Ann and Mark Baiada) was recognized as the national HHA Hero of the Year by BAYADA Home Health Care. The care and support she provided to a young woman after a devastating car accident helped the woman progress from being bedridden to working a part-time job. 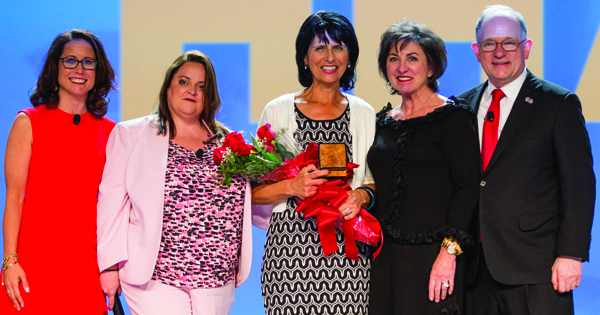 Morrison’s family, patient, and patient’s family watched as she was honored for exemplifying the highest standards of care before more than 1,800 employees at the annual awards meeting in Hershey, PA on Saturday, June 8.